Shot Glass Display Case. Commissioned piece with free reign, only requirement is it had to fit at least 50 shot glasses. I attempted to go with a more Asian styling, but once I put it to paper, like magic, it evolves into A&C. 100% Solid curly Red Oak that was left over from a Kitchen Cabinet project (don’t know how those curly pieces ended up as the leftovers). 3’ tall x 5” deep and meant to hang on a wall. Slightly different finish process on this one and the shelves are in Golden Oak with 1 coat of BLO. Drawer is sized to fit one Bottle of their favorite sprits. Doug, this is a wonderful project, but I am confused by the dimensions. Your execution is flawless, as always. I am always amazed at how much sanding there is in these little projects so I appreciate all the time you put into this. Your client has got to be loving it! You’re right, it’s supposed to read 5 inches, fixed it. Should add, the glass is 150 yo pored glass with very nice waves and bubbles. 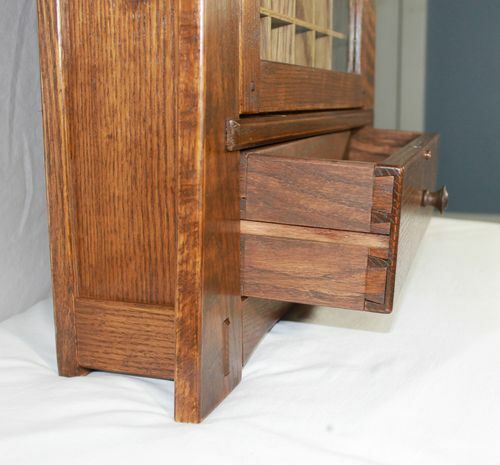 Nice joinery and a very interesting piece. I take it the oversized slots are for tall glasses? It has the look that it could’ve been made 100 years ago! Yeah, the taller slots are taller glasses or nic-nac’s. Each slot is deep enough for two glasses. Nice styling and very good work on this unique piece. You did a outstanding job on this display case, it looks and has a feeling of old world quality, craftsmanship about it. This is a beautiful piece and I love the design. Thanks for posting! I have about 80 shot glasses that need a home. I might stretch your plan out a little. Maybe a row or two higher, and row or two wider… but not sure how big to still hang on wall. I like your bottom drawer. Nicely designed, constructed and finished. Well done. I ran into that dilemma while designing this, how tall can I make while hanging it on the wall. This will fit over 100 glasses at this size, just doubled-up. I ended up felt lining the Drawer. Great looking piece. I don’t have any use for a cabinet to hold shot glasses, but this piece is so nice I want one. I’m partial to all A&C projects because of their joinery. Great design and craftsmanship. Great looking piece. 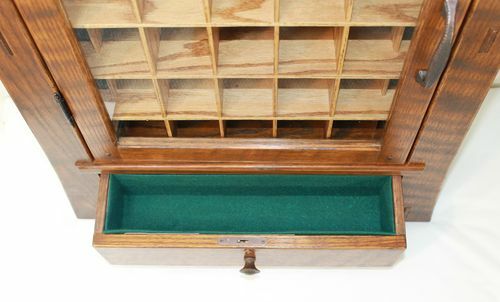 I don t have any use for a cabinet to hold shot glasses, but this piece is so nice I want one. I m partial to all A&C projects because of their joinery. Great design and craftsmanship. I designed this piece for the interior to be completely customizable. The interior shelving is one unit that slides in from the back. I’ve already got in the work to build one for myself with a different interior look.